Grab Green is boldly shaking up your cleaning routine thanks to recent scientific tests that found its laundry and dishwashing pods superior to conventional brands in removing many of today’s toughest stains and soils. Choose Grab Green’s Detergent Pods to get your laundry its cleanest and freshest – without the use of toxic chemicals. Grab Green’s fragrance-free formula features natural, earth-friendly ingredients that are safe for the environment and gentle on your family’s skin. Streamline laundry day with 3 products in 1. With each natural laundry detergent pod you get the cleaning power of eco-responsible laundry detergent combined with fabric softener and stain remover wrapped into one power-packed product. Now you can eliminate the need to add separate products to each load, making laundry day easier and your family’s carbon footprint smaller. Our fragrance-free laundry detergent pods are designed to be just as tough as the leading brands minus all the toxic ingredients that big manufacturers add to your detergent – all without sacrificing the effectiveness and deep-cleaning you demand. For people with allergies, asthma or sensitive skin, these hypoallergenic laundry detergent pods are the answer to clean laundry without any dyes, perfumes and other ingredients that can cause itching and flare-ups. This gentle yet effective formula is also designed for use in washing baby’s sheets, blankets and clothing – you can be assured that this detergent will not irritate baby’s fragile, delicate skin. Cooking for us is an enlivening practice. The sounds, the scents, the flavors—its a sensory rich ceremony that culminates with a delighted tongue and a happy belly. Gather the ingredients and go to town! Chop, grate, slice, mix, blend, sautee, swish, cling, clank! 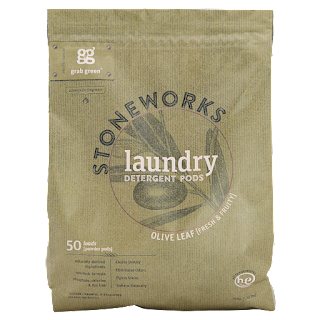 Stoneworks Olive Leaf Laundry Detergent draws from our love of cooking with freshly picked garden ingredients and our delight in utilizing freshly pressed olive oil in the kitchen and in home-made beauty remedies. The fresh & fruity fragrance takes us back to the kitchen where family & laughter become harmonious. The subdued olive green, earthy-hued packaging is constructed from Kraft paper and printed with water-based inks. The paper-sack pouch features hand-drawn illustrations of olive leaves & olives and is finished with touches of metallic accents. Soaking your dirty pots and pans overnight is a thing of the past. No longer will you wake up to a sink full of gritty, grimy, and goopy cookware that you still have to scrub. Cookware & Bakeware Cleaner Pods are naturally-derived and really pack a punch to completely rid pots and pans of the most stubborn burnt food and baked-on grease. The magic occurs immediately when the blend of naturally-derived ingredients mixes with water to penetrate the burnt, stuck-on foods. Within minutes of activation, your cookware or bakeware is free of scorched food residue. Simply rinse (you don't even have to repeat) and voilà, it's clean. Grab Green’s Automatic Dish Washing Detergent cuts through grime, removes grease, and leaves your dishes sparkling clean. Made with naturally-derived, plant and mineral-based ingredients this effective detergent leaves zero spots and is the most convenient way to get clean dishes. Did you know that our Auto-Dish Detergent Pods outperform Cascade Pacs, Cascade Complete AND Cascade Platinum? A scientific testing laboratory confirmed that Grab Green's pods have stronger cleaning power in the removal of tea with milk, red wine, coffee and several key soils! 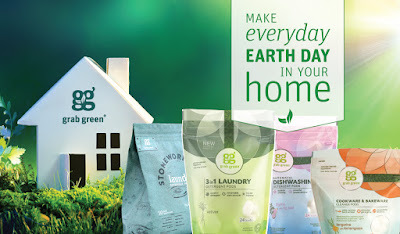 Make everyday EARTH DAY in your home with Grab Green! I absolutely love that Grab Green's products are naturally-derived from plant and mineral ingredients to create non-toxic products that actually work. I'm all for natural products, but as a mom of 4 I also need products that work. Grab Green's products not only provide me with safe products for my family but they actually do what they promise. Grab Green's 3 in 1 laundry detergent is fantastic! It's safe for the environment and gentle on your family’s skin which is great since I have a few kiddos with sensitive skin in my house. I also love that in each laundry detergent pod you get laundry detergent, fabric softener and stain remover wrapped into one power-packed product. 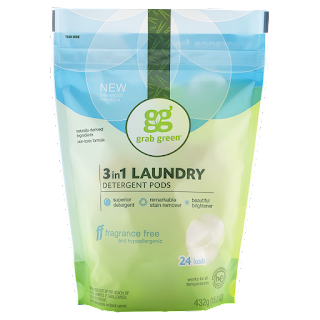 Grab Green's 3 in 1 laundry detergent pods are the answer to clean laundry without any dyes, perfumes and other ingredients that can cause itching and flare-ups. 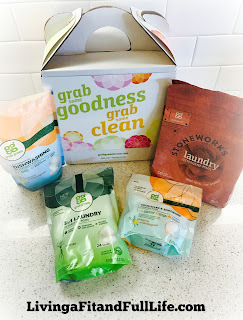 Grab Green's stoneworks laundry detergent is another fantastic product! I love that is made from natural ingredients and that it smells fantastic. Me clothes came out incredibly clean and I adore the all natural scent of this product. It's the perfect way to make the switch to an all natural laundry detergent! 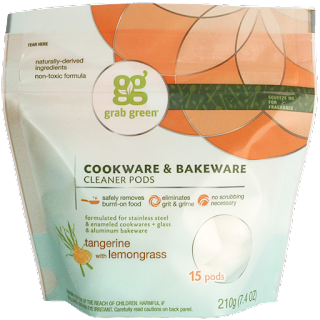 Grab Green's cookware & bakeware cleaner pods are a life saver! As a mom of 4 I do a lot of cooking so I have a lot of dirty cookware and bakeware to clean. Grab Green's cookware & bakeware cleaner pods totally saved one of my favorite pans when I completely burned dinner one night. I thought the pan was a goner because nothing would clean it. I placed one of the cookware & bakeware cleaner pods into the pan with water and left it overnight. The next morning the pan literally wiped clean with ease. I was completely blown away! I'm also quite impressed with Grab Green's automatic dishwasher detergent! In Arizona we have very hard water so my dishes end up looking dirty due to all the hard water spots that the hard water leaves behind. After once wash with Grab Green's automatic dishwasher detergent my dishes looked like brand new. The glasses were clear and not a speck of food remained. 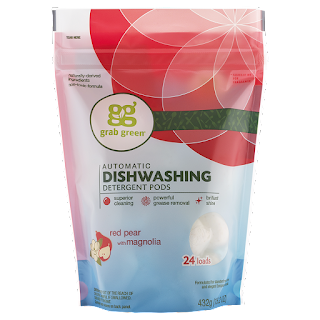 Grab Green's automatic dishwasher detergent earns and A+ in my book and I highly recommend it! Don't wait till Earth Day to go green, go green everyday with Grab Green! Click HERE to find a store near you that sells Grab Green! Click HERE to learn more about Grab Green! Follow Grab Green on social media!